Casitas Municipal Water District’s (CMWD) Ojai Water System, strives to meet, or exceed, all USEPA and state standards for safe water. To ensure that you receive the highest quality drinking water, we test beyond what state and federal regulations mandate. This report shows the results of monitoring for the period of January 1 through December 31, 2017, which is the most recent testing period required. Este informe contiene informacion muy importante sobre su agua beber. Traduzcalo o hable con alguien que lo entienda bien. Para la informacion llame por favor 805-649-2251. Board meetings are open to the public and are held on the second and fourth Wednesdays of each month at 3:00 p.m. at the district main office, 1055 Ventura Avenue, Oak View, CA, 93022. For additional details on the subjects outlined here, and for more information about Casitas Municipal Water District, visit our website, or call Susan McMahon, Water Quality Supervisor, at 805-649-2251, ext. 120. Operations and Maintenance staff work diligently to ensure high water quality at the Marion R. Walker Treatment Plant near Lake Casitas, CA. In order to ensure that tap water is safe to drink, the U.S. Environmental Protection Agency (USEPA) and the State Water Resources Control Board (SWRCB) Division of Drinking Water prescribe regulations that limit the amount of certain contaminants in water provided by public water systems. The U.S. Food and Drug Administration Regulations and California law also establish limits for contaminants in bottled water that provide the same protection for public health. Drinking water, including bottled water, may be reasonably expected to contain at least small amounts of some contaminants. The presence of contaminants does not necessarily indicate that water poses a health risk. More information about contaminants and potential health effects can be obtained by calling the USEPA’s Safe Drinking Water Hotline (1-800-426-4791). Do You Know the Source of Your Water? There are eight potential sources of water for Ojai Water System (OWS). Groundwater is pumped from the Ojai Valley Groundwater Basin through six wells located in the town of Ojai. The groundwater basin is recharged from a collection of local drainage basins, streams and creeks, as well as natural percolation from rain, agriculture, and domestic use. The water system has the ability to supplement supplies with treated water purchased from CMWD. CMWD water is a blend of ground water and surface water. The surface water comes from Lake Casitas, located near the junction of Highway 150 and Santa Ana Road. The ground water is drawn from the Mira Monte Well, located in Mira Monte. Most of the watershed is federally protected to limit contamination of the lake. For additional protection, we inspect the watershed on a regular basis. For more information, you may review the 2013 Source Water Assessment for each groundwater well serving the OWS. 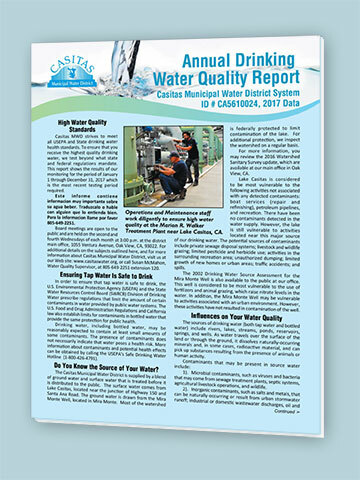 For the CMWD sources, the Watershed Sanitary Survey 2016 update, and the 2002 Mira Monte Well Drinking Water Source Assessment are also available available our main office in Oak View, CA, at 1055 Ventura Avenue. The OWS groundwater well sources are considered most vulnerable to one or more of the following possible contaminating activities. Contaminants associated with the following activities have not been detected in the water supply: permitted discharges; (National Pollutant Discharge Elimination System/waste discharge requirements) low density septic systems; agricultural and irrigation wells. The CMWD Lake Casitas source is considered to be most vulnerable to the following activities not associated with any detected contaminants: boat services (repair and refinishing), petroleum pipelines, and recreation. There have been no contaminants detected in the water supply. However, the lake is still vulnerable to activities located near this major source of our drinking water. The potential sources of contaminants include private sewage disposal systems; livestock and wildlife grazing; limited pesticide and herbicide use; activities in the surrounding recreation area; unauthorized dumping; limited growth of new homes or urban areas; traffic accidents; and spills. The CMWD Mira Monte well is considered to be most vulnerable to the use of fertilizers and animal grazing, which raise nitrate levels in the water. In addition, the Mira Monte Well may be vulnerable to activities associated with an urban environment. However, these activities have not resulted in contamination of the well. 1). Microbial contaminants, such as viruses and bacteria, that may come from sewage treatment plants, septic systems, agricultural livestock operations, and wildlife. 2). Inorganic contaminants, such as salts and metals, that can be naturally-occurring or result from urban stormwater runoff; industrial or domestic wastewater discharges, oil and gas production, mining, or farming. 3). Pesticides and herbicides that may come from a variety of sources such as agriculture, urban storm water runoff, and residential uses. 4). Organic chemical contaminants, including synthetic and volatile organic chemicals, that are by-products of industrial processes and petroleum production, that can also come from gas stations, urban storm water runoff, agricultural application and septic systems. 5). Radioactive contaminants that can be naturallyoccurring or be the result of oil and gas production and mining activities. Lake Casitas has no urban or industrial water runoff and very few residents still live in the immediate watershed. There is no oil, gas or mining production above the lake in our watershed. All public drinking water must be disinfected to prevent water-borne diseases. The Ojai Water System (OWS) is disinfected through the use of chlorine, while the CMWD water is disinfected by adding chlorine and a small amount of ammonia to form chloramines. The OWS is normally chlorinated, but there may be some occasions when the water fed to the OWS is from the CMWD source and it is chloraminated. Chloramine disinfection is approved by the SWRCB Division of Drinking Water and the US Environmental Protection Agency. Many United States and Canadian cities have used chloramines for decades to disinfect water. Chloramines reduce the level of unwanted disinfection by-products in our water. Disinfection by-products are formed when chlorine mixes with naturally occurring organic material in water. Currently, regulated disinfection by-products include trihalomethanes and haloacetic acids. Chloramines stop the formation of these byproducts, and chloraminated water has less of a chlorine taste and odor than chlorinated water. Chloramines do not pose a health hazard to the general population. Chloraminated water is safe for drinking, bathing, cooking and other normal uses. Two specific groups of people, however, do need to take special care with chloraminated water - kidney dialysis patients and tropical fish hobbyists. Kidney patients are not harmed from drinking, cooking or bathing in chloraminated water. However, there is a problem that needs to be addressed for individuals who are undergoing dialysis treatment on artificial kidney machines. Chloramines must not be present in the water used in dialysis machines. Chloramines can be removed through a filtration system. Chloramines are toxic to fish and other animals that use gills to breath. While chlorine will evaporate rather quickly from standing water, it may take weeks for chloramines to disappear. Thus it is necessary to dechlorinate water used for aquariums and fishponds. We suggest using a filter system or a dechlorinating agent sold at most pet stores for fresh and saltwater aquariums and fishponds. Another option is to install a high-quality granular activated carbon (GAC) filter in your home. The chloramine residual in water used for fish should be kept below 0.1 parts per million. Contact your local pet store or fish shop for additional assistance. Chloramines will not affect the chlorine balance in your backyard swimming pool. You still need to add chlorine to retard algae and bacterial growth. Chloramines have no affect on plants, vegetables or fruit trees. For more information on chloramines call 805-649-2251, ext. 120. Fluoride is not added to the water, but there is some naturally-occurring fluoride in the water. This level was tested at an average of 0.4 mg/L for all sources during 2017. For more information on fluoride, check the SWRCB Division of Drinking Water’s Fluoridation website for more information on fluoridation, oral health, and current issues. The latest results from OWS lead and copper testing were below the action levels. CMWD adds a small amount of phosphate to the water from the Lake Casitas source to lower the corrosivity and reduce copper levels, as part of our Corrosion Control plan. If present, elevated levels of lead can cause serious health problems, especially for pregnant women and young children. Lead in drinking water is primarily from materials and components associated with service lines and home plumbing. CMWD/OWS is responsible for providing high quality drinking water, but cannot control the variety of materials used in private plumbing components. When your water has been sitting for several hours, you can minimize the potential for lead exposure by flushing your tap for 30 seconds to 2 minutes before using water for drinking or cooking. If you are concerned about lead in your water, you may wish to have your water tested. Information on lead in drinking water, testing methods, and steps you can take to minimize exposure is available from the Safe Drinking Water Hotline or at http:// www.epa.gov/safewater/lead. Elevated levels of copper can occur when corrosive water causes leaching of copper plumbing. Additionally, as part of the school lead testing program, CMWD sampled four schools in the OWS service area and provided them with testing results. Some people may be more vulnerable to contaminants in drinking water than the general population. Immunocompromised persons, such as persons with cancer undergoing chemotherapy, persons who have undergone organ transplants, people with HIV/AIDS or other immune system disorders, some elderly, and infants can be particularly at risk from infections. These people should seek advice about drinking water from their health care providers. USEPA/Centers for Disease Control (CDC) guidelines on appropriate means to lessen the risk of infection by Cryptosporidium and other microbial contaminants are available from the Safe Drinking Water Hotline at 1-800-426-4791. Unregulated contaminant monitoring helps USEPA and the SWRCB Division of Drinking Water to determine where certain contaminants occur and whether the contaminants need to be regulated. Casitas sampled for unregulated contaminants during 2013; see the table for sampling results. Download the report: 8.5 x 11 in. | 11 x 17 in. 8.5 x 11 in. | 11 x 17 in. Casitas Municipal Water District’s (CMWD) Ojai Water System, strives to meet, or exceed, all USEPA and state standards for safe water. To ensure that you receive the highest quality drinking water, we test beyond what state and federal regulations mandate. This report shows the results of monitoring for the period of January 1 through December 31, 2017, which is the most recent testing period required. Este informe contiene informacion muy importante sobre su agua beber. Traduzcalo o hable con alguien que lo entienda bien. Para la informacion llame por favor 805-649-2251. Board meetings are open to the public and are held on the second and fourth Wednesdays of each month at 3:00 p.m. at the district main office, 1055 Ventura Avenue, Oak View, CA, 93022. For additional details on the subjects outlined here and for more information about Casitas Municipal Water District, visit us at our Web site: www.casitaswater.org, or call Susan McMahon, Water Quality Supervisor, at 805-649-2251 extension 120.